By Doug Mullins, SeamSAFE inventor and specialty roofer. As inventor of SeamSAFE anchors and brackets, I have the pleasure to speak with fellow standing seam roofers on a regular basis. They reach out by phone and email with questions about SeamSAFE and their specific safety needs. I consider talking with roofers and answering inquiries among the most important activities I do each day. There is one question that I receive regularly. It concerns how SeamSAFE anchors compare to other devices that are on the market. This frequently asked question is an excellent one since there are standing seam roof anchors that look similar at first glance. Yet, while anchors may look alike, there are important safety distinctions to consider. 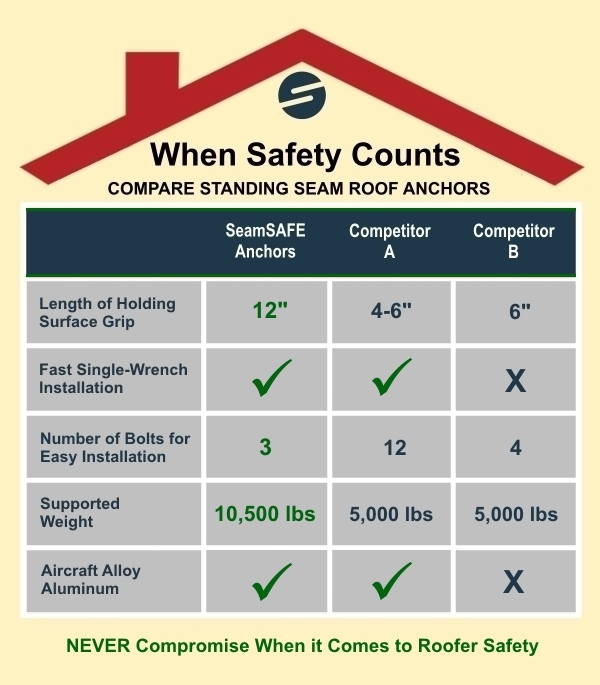 ​ Here’s how I respond when asked: "How do SeamSAFE anchors compare to other standing seam roof anchors?" All anchors are not created equally. The size of the anchor’s holding surface is a crucial safety factor. SeamSAFE anchors lead the industry with 12 inches of gripping surface, compared to only 4 to 6 inches that other anchors provide. An anchor's holding power is key. SeamSAFE anchors are certified to support up to 10,500 pounds, which far exceeds other safety anchors for standing seam metal roofers. SeamSAFE anchors are the only safety anchors that feature single-wrench installation with a three-bolt clamping design. This design makes installation fast and easy for roofers, while enhancing productivity. In fact, it takes a minute or less to install a SeamSAFE anchor. Unlike other anchor distributors, SeamSAFE is a small family-operated business. I personally oversee every aspect of manufacturing. You can talk directly to me whenever you have questions. SeamSAFE anchors are unique in that they may be paired with versatile SeamSAFE roof brackets to create a complete system of secure support for standing seam roofers, their tools and materials during roofing jobs. If you would like to learn more about SeamSAFE, please peruse this website. Or better yet, give me a call at 855.263.1521. I look forward to speaking with you. Doug Mullins, owner of Construction Specialty Anchors LLC and creator of SeamSAFE anchors and brackets, has more than 40 years in the roofing industry. His own experience with a life-threatening fall from a standing seam metal roof inspired him to create SeamSAFE anchors. Today, SeamSAFE anchors and brackets (www.seamsafe.com) are widely used throughout the country by roofing companies, contractors, and even NASA.